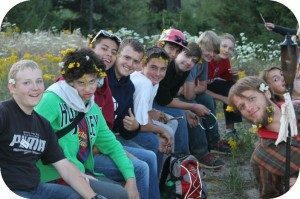 YMCA Teen Camp is the ultimate summer camp experience for teens. Social time for building friendships and opportunities to try all the camp activities from archery to the zip line keep teens active and engaged as they enjoy a fun-filled week away in the great outdoors. Community and sportsmanship are always at the forefront of Teen Camp as campers compete in several challenges against their peers from other cabins. We strive to help campers develop a better sense of self as well as compassion for those around them by consistently reflecting upon the YMCA’s core values of Caring, Honesty, Respect, and Responsibility. Campers stay in yurts or platform tents with ten or fewer similar age, same gender campers and are supervised by two staff.